Texan Shanna Peeples, the 2015 National Teacher of the Year, is an English teacher at Palo Duro High School in Amarillo, which has seen an influx of refugees from countries like Myanmar in recent years. 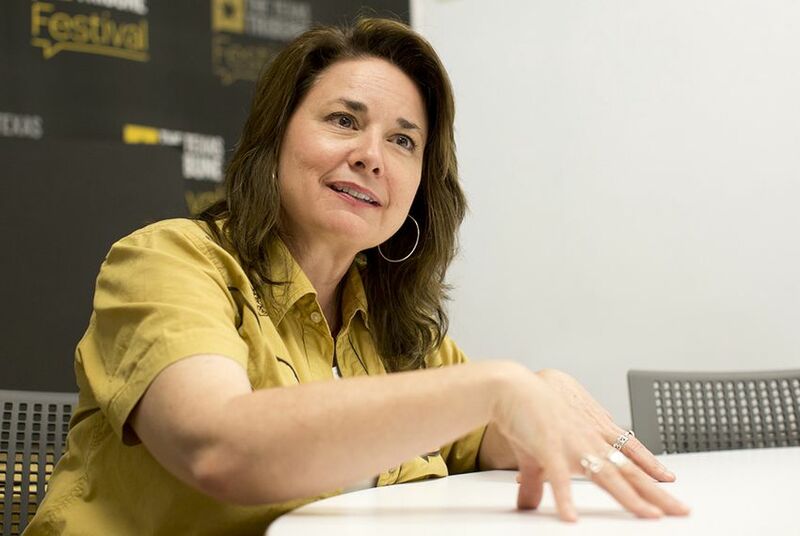 As the 2015 National Teacher of the Year, Texan Shanna Peeples represents the best of more than 3 million educators in classrooms across the country. President Obama presented Peeples with the title on April 29 in a White House ceremony. Peeples is an English teacher at Palo Duro High School in Amarillo, where she teaches AP English, English as a Second Language and special education. Amarillo has seen an influx of refugees in recent years from countries such as Myanmar bringing marked changes to local schools. Some students who arrived in Peeples' classroom had never seen indoor plumbing; some had never had any schooling. Peeples, a former newspaper reporter, earned an English degree from West Texas A&M University and a master's in curriculum from the University of Texas at Arlington. She is a literacy trainer for her district, and she gives presentations across the state as part of the Texas Council of Teachers of English Language Arts. Peeples sat down with The Texas Tribune on Monday to discuss her new title and education in the state. The following is an edited and condensed transcript of the interview. Texas Tribune: What has your experience been as the new Teacher of the Year? Shanna Peeples: I’m still not over even being Texas Teacher of the Year, when you consider there are 330,000 teachers here in Texas who do amazing work. Some of them deal with much more difficult cases than me. Then to think at the national level, I am representing more than 3 million teachers, it is overwhelming. TT: When you were awarded this title in Washington, D.C., President Obama credited you with motivating students to go after courses like AP English. How do you get students to do that? Peeples: Many don’t want to. It sounds silly, but I get a lot of them to take the test by making them cookies and brownies. For whatever reason, they like that. We’ve had some of the successes with previous students who have gone on to do great things and they have been little symbols of hope for these kids. They see that it is possible. TT: So does it come down to individual conversations with each student? Peeples: It does. That is not something that runs from 8 to 4 o’clock. Those conversations happen all the time. A lot of students come in and eat lunch in my room. We have a lot of dinner-table conversations that maybe they are not having with a parent, but they are having with me or another teacher. That is kind of how we build that relationship with them to help push them, based on what they say that they want to accomplish. TT: These attributes likely led to your Teacher of the Year award. So when you got the award in Washington, D.C., what was it like to be at the ceremony? Peeples: It was extremely humbling. I felt very much the responsibility of representing Texas and hoping that I didn’t mess it up for anybody. But what I have noticed everywhere I go is that people love teachers. They just do. When people react to me, my ego would love to think it is about me, but it is really not. It is about what this position is symbolic of, of a teacher that they loved, or a teacher that has really worked with their kids. I think that is what people are responding to. TT: Did you really go to a coffee shop with the president after the ceremony? Peeples: I did and he paid for it. Apparently he doesn’t do that sort of thing normally. He came out and his little shirt sleeves were all rolled up. It was a very surreal experience. Here is this very focused, very engaged man, who just happens to be the president of the United States, asking me questions about my school and my students. TT: What did you two talk about? Peeples: He wanted to know what I thought about his two-year college initiative. I told him it was a personal thing for me because it has benefited my family greatly. Junior college has really helped them. My youngest daughter is at a junior college right now, in our hometown of Amarillo. I know that several of the things that they have put in place already are really helpful: the two-year college initiative and the Teach to Lead initiative, which helps to create hybrid roles for teachers, like what I do. You keep your good teachers teaching and you don’t shuffle them off to administration. We do need good principals, but we need to keep good teachers in the classroom. TT: Did you know you wanted to be a teacher early on? Peeples: I think I always did, but I was afraid of it. I was afraid that it was going to take a lot out of me and that it was going to be sad, and hard. I tried to avoid it with things that seemed glamorous and fun. The last job that I had right before I became a teacher was as a reporter in Amarillo. I covered education as part of my beat. The more I was in those classes with kids, the more I wanted to be there. I realized it is more fun to talk to kids and work with kids than to write about them. That is kind of what pulled me over. I went straight from reporting into a seventh-grade classroom. TT: Your professional experience is different from traditional teacher training. What is your view of that kind of experience? Peeples: I think what all those jobs gave me was a depth of experience. I think for many teacher candidates, we almost need to do what they do with doctors. I don’t think one semester is enough of student teaching. That is kind of hard for me to say, not having had any; I went straight into it. But the student teachers that I have worked with, I think they would feel better having at least year, rather than just a semester. Then they can truly commit to the job. Then they will have spent a year seeing the cycle that a year goes through. The way it starts at the beginning, the way it bottoms out in the middle of the year, and it gets really exhausting and then how it picks back up at the end of the year. That is really the best part of the year. TT: What kind of training is needed for a teacher who will deal with students from low-income families or English language learners who have suddenly relocated, like you have experienced in Amarillo? So when you are a middle-class teacher, and you say to a child, for example, “I suggest you do your homework,” a child in poverty will hear that at its face value. It is a suggestion. Whereas the middle class child knows it is not a suggestion. That was a hard thing for me to understand. TT: Amarillo has has felt a big impact in population shift in recent years with large numbers of refugees. What does that do to the classroom? Peeples: It felt like it was an overnight change. We were so unprepared. I don’t know how you could prepare. There had been a wave of migration from Southeast Asia, from Vietnam and Laos. We have established communities there in Amarillo in the '70s. That, we were used to. None of us knew anything about Burma, East Africa or the special circumstances that children were bringing with them. My co-teacher and I, when we took on that first class of refugee students, newcomers, we had to go online and do tons of research because we couldn’t understand what we were seeing. There were behaviors that we had never seen. Some had never seen indoor plumbing, or used a kitchen. Some had no schooling whatsoever, so the first time they sat down in our chairs was the first time they had been cultured to a school setting. It was not normal to them. It was a master class in culture and language and customs. It was overwhelming to us, across the district. TT: Do you see trauma in your classes? Peeples: Totally. That is the most woefully underfunded need of students. It is a sort of invisible need that we don’t think about and that is mental health services. TT: How could you better deal with trauma in a school setting? Peeples: The same way we have a school nurse on staff, we’d have a dedicated counselor. But we are asking so much of counselors now that they have their hands tied. We need a dedicated mental health counselor. We see students that have struggled with depression, severe anxiety, what really seems like post-traumatic stress disorder. They have seen horrible things, and that's not just my refugee students. That includes regular students growing up with domestic violence. Safety is the No. 1 thing you have to have when you deal with children in trauma. They have to feel physically safe and emotionally safe. You can’t learn when you are terrified. That is something I hope to bring more attention to in this position. There are particular needs for students in trauma and how trauma is related to poverty. TT: What is your perspective of education in the state overall? Peeples: I am concerned about the idea that is being floated about tying teachers salaries to test scores. A discussion we need to have is how you make that system fair. One of my best friends at Palo Duro is the choir teacher, but she doesn’t have a test. I have a test. How do you put us on a level playing field? TT: You teach high school, but do you have a perspective on Gov. Greg Abbott’s pre-K proposal we are seeing right now in the Legislature? Peeples: It sounds crazy, but you can tell at the high school end who had pre-K. You can see. Tons of research support that early intervention pays off in huge dividend down the roads. It is an initial investment up front, but you are not having to remediate at the other end, which requires expensive solutions. TT: Do teachers, doing their daily work, feel prompted to join the conversations about their work at the policy level? Peeples: The short answer is no. Part of that is the nature of the job. It is very hard for teachers to leave the classroom. That is what we got into it for, not to do policy. We want to work with kids, so teachers pull themselves back from that. But we need to be sensitive to the teacher voice and include them if you really want the nuts-and-bolts view of how a policy would impact real kids in a classroom, on a daily basis. TT: If there were a policy change that could make a really big impact in the classroom, what would that be? Peeples: I really think it is assessment. We really need to look at how we are assessing student learning. What you assess drives your curriculum. The assessment can see what you know, but it can’t see what you can do. It is notoriously difficult to pick up character, persistence, creativity, innovation, collaboration off a standardized test. That is why our assessments need to go toward more of a portfolio-based assessment, in addition to our standardized test. That is my hope. Disclosure: The University of Texas at Arlington is a corporate sponsor of The Texas Tribune. A complete list of Tribune donors and sponsors can be viewed here.